Score Free Bonus Games With Razer zGold! Besides from dropping an awesome Monday Motivation Bundle for you today, we’d also like to announce that we’ve teamed up with our gaming buddies at Razer to bring you even more bang for your buck! From now till February, we’ll be running a series of promos with Razer that allow you to win top-notch bonus games if you purchase with Razer zGold. Check out what’s hot now below. 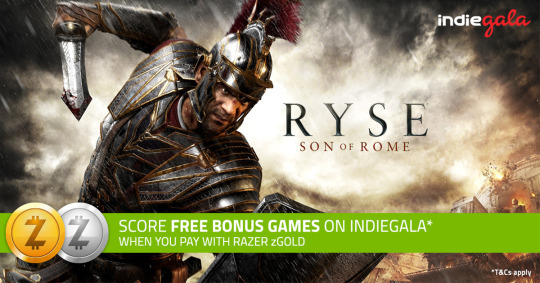 Spending a minimum of $12.99 with your IndieGala purchases (checking out with Razer zGold) will score you Ryse: Son of Rome (worth $19.99) for free! This week, we’ve already put together a list of some indie game gems that you can grab with Razer zGold and snag your free copy of Ryse: Son of Rome. But there’s an even juicier part! Right now if you spend anything over $3/€3 on IndieGala, you also get a free copy of Between Me and The Night (worth $12.99). So it’s a no-brainer. Spend your zGold wisely and you should be able to knock off a good number of wishlist items this week. Now is the time! Till January 23rd, all existing or new Razer ID customers who verify their zVault accounts will receive Bonus 100 zGold PLUS 2,000 zSilver as a starter gift pack. That’s a 2X boost of zSilver for all Razer fans! Take a look at some of IndieGala’s top deals today and get your zGold ready! And stay tuned because we’ve got more goodies in store planned with Razer!